Micah is a member of this year’s Timothy Team from T Bar M Camps in New Braunfels, Texas. What a thrill it was to hear Micah express his growing appreciation for learning to tell and teach God’s grand story of the Bible while exploring the land of the Bible. Micah, the rest of the twelve-member Timothy Team, and two leaders departed for Israel on January 31st, New Year’s Eve. This trip was the twelfth time I have shepherded the Timothy Team through an exploration of the land eternally promised to the physical descendants of Abraham, Isaac, and Jacob. We touched down at Ben Gurion International Airport at 4 P.M. on New Year’s Day. For the next sixteen days, we traveled the length and breadth of Israel from Dan to Beersheva, just like the twelve spies sent out by Moses from Kadesh Barnea about 3,000 years ago. Our purpose was simple. 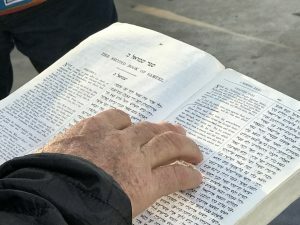 Disciple Daily uses these tours to introduce the fact that the Hebrew Bible (Old Testament) is the indispensable foundation for correctly understanding the life and ministry of Yeshua HaMashiach, Jesus Christ. The first day, we headed south into the Negev where Abraham, Isaac, and Jacob lived a nomadic lifestyle. His life then was similar to the life Bedouins lead in the area today. Just as God promised Abraham, his descendants served as Pharaoh’s slaves for 400 years in Egypt. Because of their unwillingness to follow God into the Promised Land, the tribes of Israel were forced to wander in the wilderness for forty years. While the eternal relationship between God and the Chosen People was never in question, Jewish disobedience to His desire for them to take the land of the Canaanites led to their exile from the best God had prepared for them. During that period, the Jews saw some of the same scenery we enjoyed on the eastern side of the Jordan River in Wadi Rum, located in southern Jordan. God prohibited the Exodus Generation from entering the Promised Land. Moses also paid the same penalty his people paid for disobeying God. He died on Mt. Nebo after looking into the land he longed for Israel to possess. After looking seeing Eretz Yisrael from the top of Mt. Nebo, our team crossed the Jordan River close to where the Joshua Generation walked across it on dry land. Throughout Joshua’s career as Israel’s leader, the Jews conquered 31 Canaanite cities. However, they did not do what God told them to do. They did not kill every man, woman, and child in the land given to them by the Lord. The result was that the environment of the Promised Land became dangerous to the fulfillment of God’s purpose for calling Israel to Himself in the first place. Israel was to be light, an example, to the whole world. The Jews were to demonstrate a vibrant and dynamic relationship with Israel’s Creator to the Nations. Israel failed. Joshua (יְהוֹשֻׁעַ) means “Jehovah is salvation.” It is the same name translated as “Iesous” in Greek, “Iesus” in Latin, and finally as “Jesus” in English. Joshua led Israel into war against the darkness of Canaanite idolatry at virtually the same location Yeshua crossed the Jordan after being tempted by Satan in the wilderness for forty days. Yeshua completed the job that the Joshua generation began. Jesus finished everything the Father sent Him to do through His life, death, burial, and resurrection from the dead. Today, Yeshua’s salvation ministry in the world is taking place through the Church that He is building. As His image bearer, Jesus followers are commanded to step boldly into the idol infected world of the 21st Century and take it for Him. 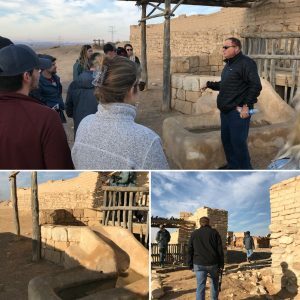 Crossing the Jordan River, the Timothy Team visited an Israeli site opposite “Bethany beyond the Jordan” to give a testimony of our intent to do just that, take territory for God’s glory. Four Timothy Team members decided the Jordan River was the place they would make a public proclamation of their intent to make disciples who make disciples for the rest of their lives. During our trip to Israel and Jordan, the Timothy Team discovered something I wish the entire Church would see. By experiencing the grand story of God, one story at a time, we saw God at work in our individual lives to create a stronger community with a single purpose. Notice that word. Community. God built a unified understanding of His Word among 15 people from very diverse backgrounds. He gave us an uncommonly common understanding of what the Bible says, what it says about what God wants to accomplish through the lives He gives us, and how to teach others to do the same. That is discipleship. On February 11th, the Timothy Team will be on the move once again en route to Kiev, Ukraine. Our purpose is to teach the leadership of Camp Karabin how to teach the grand story of God to those they will host next summer. Over 1,000 young people will be introduced to Jesus through the first three stories of the Bible. Creation (Genesis 1:1-2:3), Adam and Eve (Genesis 2:4-25) and the Fall (Genesis 3:1-24) set the foundation for everything else the Bible teaches. It is our prayer that through the staff of Camp Karabin Ukrainian campers will return home having committed to be Jesus followers and teach the Stories of God where they live, work, and play for the rest of their lives. 1. Safe travel and the ability to rest while in transit. 2. Effective communication through our translators with those we are training. 3. Awareness of cultural differences that can get in the way of Kingdom work. 4. Unity among all who participate in this training. 5. Sweet fellowship with the families who will host our team in Kiev. 6. Many to come to saving faith through the teaching of the Stories of God next summer at Camp Karabin. 7. God to receive all the glory from our work together. 8. God to expand His Kingdom throughout Ukraine and the rest of Eurasia. You can follow our time in Ukraine on Instagram @DiscipleDaily210 or on our Disciple Daily FaceBook page. Arlie, at our age you would think the long trips would wear us out. But you and I thrive on them, even as we grow older? Yes, we do. Sitting home watching the grass grow isn’t nearly as appealing as watching God at work around us. Let’s keep it up!